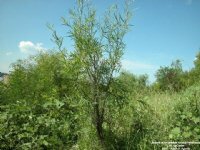 SANDBAR WILLOW - a medium sized suckering shrub reaching a height of 5 to 10 feet. This specie forms dense thickets for wildlife habitat with its wide spreading root system. Also useful as an aggressive colonizer in riparian plantings, does well in moist sites & survives severe flooding. Native across the U.S.
Cultivar: 'Silver Sands' Sandbar Willow - a form with silvery pubescent foliage.